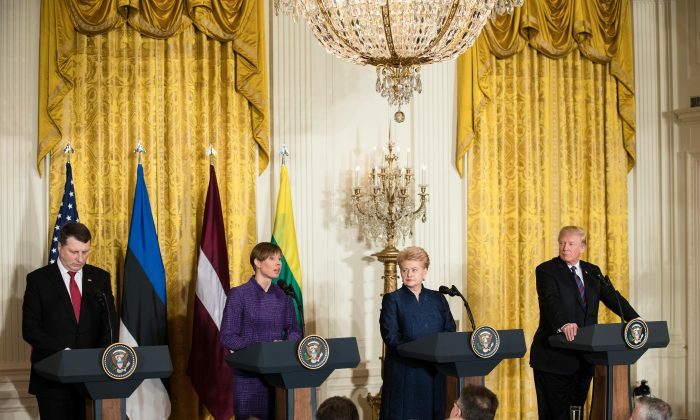 The leaders of the Baltic nations Latvia, Estonia, and Lithuania visited President Donald Trump on April 3 to seek more military assistance from the United States against Russian expansionism. President Raimonds Vejonis of Latvia, President Kersti Kaljulaid of Estonia, and President Dalia Grybauskaite of Lithuania met with Trump at the White House to discuss security matters and enhance cooperation in defense and energy. The Baltic countries with a combined population of 6 million face an uncertain future in their relations with Russia. They have been raising concerns about Russian President Vladimir Putin’s intentions in the region, especially since Russia seized the Crimean Peninsula from Ukraine in 2014. They fear that Moscow could use military force against the Baltic states. These countries have been pressing the United States and North Atlantic Treaty Organization (NATO) to take additional security measures in the region to deter any potential aggression from Russia. The Baltic leaders called for a permanent U.S. military presence in the region. During the meeting, Trump did not announce any specific deployment of U.S. troops. Instead, the White House announced plans “to provide nearly $100 million for procurement of large-caliber ammunition and over $70 million in training and equipping programs” to boost the capacity of the Baltic countries’ military. “Nobody has been tougher on Russia than I have,” said Trump, in response to a question in a press conference with the Baltic leaders, as to whether he saw Putin as an enemy or not. Trump and the Baltic leaders have also agreed to enhance cooperation in energy security and independence. The countries will collaborate to “diversify energy sources, supplies, and routes throughout the Baltic region, including expanding exports of U.S. liquefied natural gas,” said Trump. Too much dependence on Russian natural gas had allowed Moscow to charge high prices to the Baltic nations and made the region vulnerable to Russian influence. The Baltic countries have moved to increase their independence from Russian gas in recent years. Lithuania began importing liquefied natural gas from the United States in 2017. This year, the Baltic nations are celebrating the 100th anniversary of their independence following World War I. The independence was short lived, as the Soviet Union occupied and annexed the region during World War II. Latvia, Estonia, and Lithuania were under Soviet rule during the Cold War until they regained their independence in 1991. They joined the European Union and NATO in 2004.